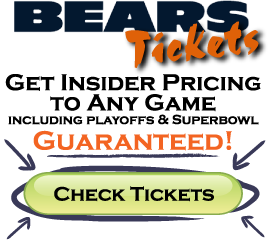 Based in Chicago, Illinois -- the Bears is a professional football team which has been highly awarded by its accomplishments in the National Football League as well as their trajectory. The origins of the team go back to 1919 when it was originally founded. The Bears currently played for the national football conference North division however, it hasn't always been so. From 1933 to 1949 they played for the Western division, for two years (1950 to 1952) the Bears were part of the national conference, then from 1953 all the way to 1969 they played as part of the Western Conference. Following this trajectory we find that for nearly 30 years (1970 to 2001) they were part of the NFC Central division. When it comes to championships, awards and accomplishments the Chicago Bears are one of the elite teams which has incorporated itself not only as a successful franchise but in the hearts of American pop-culture. To quickly summarize the list of achievements this team has had we must start by mentioning that they have won eight NFL championships and have also wona Super Bowl championship, not to mention the many accomplishments achieved as part of the NFC West, Central and North division. Their first NFL championship was earned in 1921, then in 1933 they earned the top position once again when they defeated the New York Giants by a very close margin of 23 to 21, in 1940 they come back the battle another title this time against the Washington Redskins however, the game turned out to be a disappointment for many fans due to the wide margin achieved by the Bears (73 to zero). In 1941 they once again take on the New York Giants and this time they are able to defeat them by a wider margin (37 to 9), in 1943 they go up against the Washington Redskins and come out victorious after winning by a margin of 41 to 21. In 1946 they are able to once again defeat the Giants by a score of 24 to 14 and last but not least they make their appearance in 1963 to defeat the same team they have been able to overcome in the past, the Giants. In 1985-86 they were crowned champions when they defeated the New England Patriots by a wide margin, 46 to 10. Brian Urlacher contract situation has been a hot topic when it comes to the Bears however, the general manager Jerry Angelo reassured to many of the fans that the Pro Bowler wants to be a Bear for life. Several people were expecting Urlacher to skip the mini-camp while he tried to extend his contract but for surprise of many he opted to show up to the training and keep himself in good shape instead of going through legalities. Many of the 4th phase club members will be able to enjoy the many games scheduled for the 2011 - 2012 season which are guaranteed to be electrifying. Getting tickets for any of their games is without a doubt money well spent. The second of April 2009, the Bears made one of the biggest trades in franchise history, by getting the rights to acquire Pro Bowl quarterback Jay Cutler and a 5th round selection in 2009 NFL Draft from AFC West rivals Denver Broncos, in exchange for quarterback Kyle Orton. Selected around the Bears first and third picks in 2009 NFL Draft, Jay Cutler became the center of the Bear's offense overnight. The Broncos got a first round selection in 2010 NFL Draft in exchange. February 1, 2010, was the date the Bears acquired highly rated offensive guru Mike Martz. Martz was hired by the Chicago Bears as new offensive coordinator. On March 5th 2010, the Bears made a big splash in free agency, signing defensive specialist defensive end Julius Peppers and running back Chester Taylor, and tight end Brandon Manumaleuna all the while spending over $ 100 million on the first day of free agency. Chicago Bears had won 700 regular season games on Nov. 18, 2010, and beating the Miami Dolphins 16-0. This makes the Bears the first team in the NFL with regular-season victory to reach the 700 mark. On December 20, 2010, the Bears defeated the Minnesota Vikings 40-14 in the Minneapolis TCF Bank Stadium for the title of the NFC North division for the third time in six years, but the first time since 2006, when they reached Super Bowl XLI. With a 38-34 victory against the New York Jets, the Bears won the No. 2 seed and a bye in the first round of the NFL playoffs 2010-11. They reached the NFC Championship game after defeating the Seattle Seahawks, where they played the Green Bay Packers at Soldier Field - the second playoff meeting between the two floors of rivals, the only other game played in 1941 . The Bears lost the game, 21-14. 2011: Classification draft super computer CBS Sports has predicted that the team will seek a consensus All-American left tackle Gabe Carimi, 2010 Outland Trophy winner as a lineman in the country within the university, with its selection at No. 29 the first round of April 2011 NFL Draft. Ownershipof the team is headed by Virginia McCaskey, her children and grandchildren control 80% of the team, and Mrs. McCaskey votes her children stock shares as well. Patrick Ryan, chairman of Aon Corporation and Aon director Andrew McKenna own 15% of the club, and Kevin has 5% of the club. The Chicago Bears have one of the most storied histories in all of sports beacuse of the McCaskey family and their hard work in persuing a champion all of these years. In 2008, Forbes magazine reported that the Chicago Bears franchise is worth 1.1 billion U.S. dollars making it the ninth richest franchise in NFL. Chicago is the second largest market in the National Football League. The team has major sponsorship deals with Chase, Miller Brewing Company, Cadillac, United Airlines, Motorola, U.S. Cellular, Coca-Cola. It was the first NFL team to present the sponsor with the 2004 season advertised as "Bears football presented by Chase." In addition, the Bears reached an agreement WFLD-TV (Fox affiliate in Chicago) to broadcast the football pre-season games.